An unbeatable, pocket-sized guide to New York City, packed with insider tips and ideas, color maps, top 10 lists, and a laminated pull-out map - all designed to help you see the very best of New York City. Take a New York walking tour, see world-famous paintings at the Metropolitan Museum of Art, explore leafy Central Park, or take in the incredible views from the top of the Empire State building. From Top 10 Places for Children to Top 10 Festivals and Events--discover the best of New York City with this easy-to-use travel guide. Staying for longer and looking for a more comprehensive guide to New York? 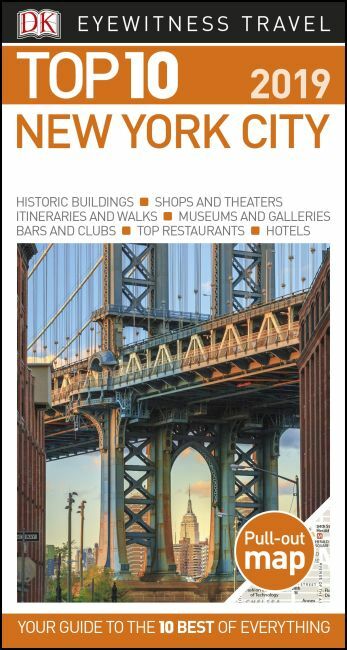 Try our DK Eyewitness Travel Guide New York or our DK Eyewitness Travel Guide USA. About DK Eyewitness Travel: DK's Top 10 guides take the work out of planning a short trip, with easy-to-read maps, tips, and tours to inform and enrich your weekend trip or cultural break. DK is the world's leading illustrated reference publisher, producing beautifully designed books for adults and children in more than 120 countries.